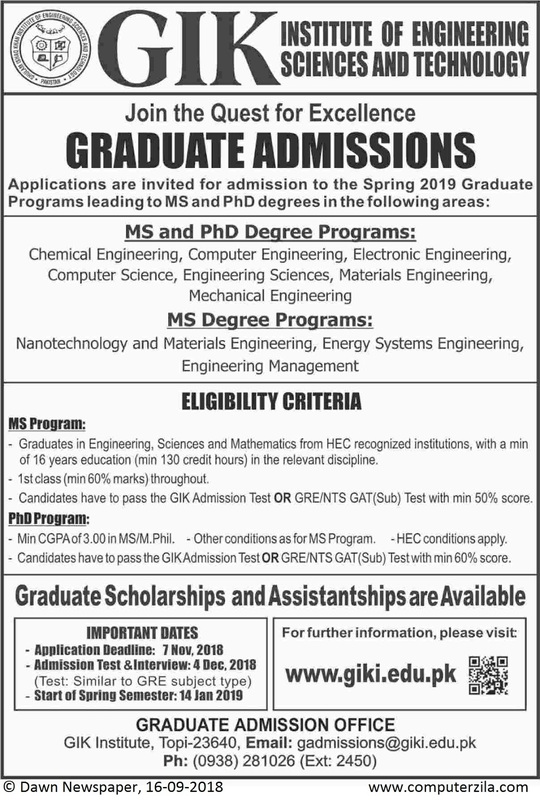 Admissions Open at Ghulam Ishaq Khan (GIK) Institute of Engineering Sciences & Technology's Main Campus for the batch Spring 2019. GIKI offers admissions in different fields of study for Master and PHD Programs. Masters EligibilityGraduates in Engineering, Sciences and Mathematics from HEC Recognized Institutions, with a minimum of 16 years education (min 130 credit hours) in the relevent descipline. University DescriptionThe Ghulam Ishaq Khan Institute of Engineering Sciences and Technology (Urdu: غلام اسحاق خان انسٹیٹیوٹ‬‎; commonly referred as GIK, is a private research university located in Topi, Swabi, Khyber Pakhtunkhwa, Pakistan. GIK has eight academic faculties strongly emphasizing on science and engineering and its 400 acres (1.6 km2) primary campus is located in the vicinity of Swabi district of Khyber Pakhtunkhwa, Pakistan. Campus AdressTopi 23640, District Swabi, Khyber Pakhtunkhwa, Pakistan.